EDUCATIONAL AND INFORMATION SHARING SERVICES THROUGH INTERACTIVE DISCUSSION FORUMS FOCUSING ON BUSINESS, FINANCE, ECONOMY AND OTHER CURRENT AFFAIRS AND THEIR EFFECT ON CORPORATIONS AND PUBLIC SECTORS IN THE GLOBAL ECONOMY. 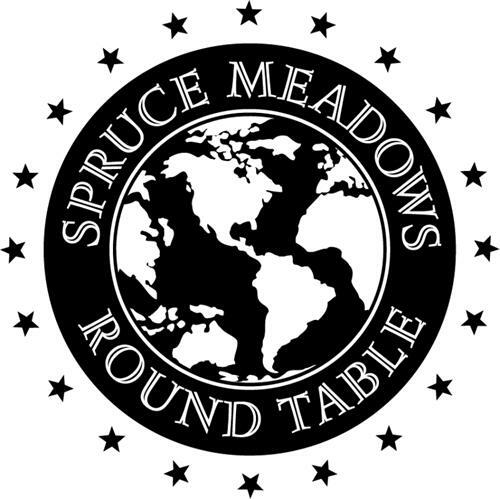 On Monday, December 8, 2008, a canadian trademark registration was filed for the above pictured logo by SPRUCE MEADOWS LTD. R.R.#9, 18011 Spruce Meadows Way, Calgary, ALBERTA, CANADA T5J5G5. The Canadian IP office has given the trademark application number of 1421052. The current status of this trademark filing is Registration published. The correspondent listed for is BENNETT JONES LLP of 4500 BANKERS HALL EAST, 855 - 2ND STREET S.W., CALGARY, ALBERTA, CANADA T2P4K7 The trademark is filed in the description of EDUCATIONAL AND INFORMATION SHARING SERVICES THROUGH INTERACTIVE DISCUSSION FORUMS FOCUSING ON BUSINESS, FINANCE, ECONOMY AND OTHER CURRENT AFFAIRS AND THEIR EFFECT ON CORPORATIONS AND PUBLIC SECTORS IN THE GLOBAL ECONOMY. .
855 - 2ND STREET S.W. (3) More than three stars -- Note: Not including constellations and groups of stars of division 1.11. (1) - EDUCATIONAL AND INFORMATION SHARING SERVICES THROUGH INTERACTIVE DISCUSSION FORUMS FOCUSING ON BUSINESS, FINANCE, ECONOMY AND OTHER CURRENT AFFAIRS AND THEIR EFFECT ON CORPORATIONS AND PUBLIC SECTORS IN THE GLOBAL ECONOMY.